Lokomotiv bounced back from Friday’s 1-6 drubbing against SKA to win 3-1 on home ice. 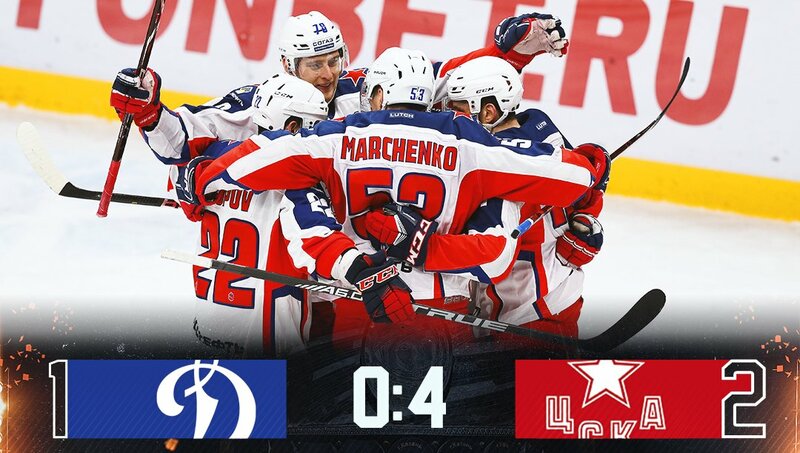 In Moscow, CSKA went to Dynamo and plundered three power play goals to regain the lead in the series. CSKA moved back in front in this series with a convincing victory in game three. Two days after failing to score on Dynamo at home, the Army Men needed less than four minutes to beat Ivan Bocharov. Second period goals from Konstantin Okulov extended the lead and Ilya Sorokin’s shut-out ensured a solid victory for Igor Nikitin’s team. For its part, Dynamo paid the price for penalty troubles. Three of CSKA’s four goals came with the Blue-and-Whites on the PK. After such a disciplined display in Friday’s 1-0 overtime success, this was a huge disappointment for Vladimir Krikunov’s men. The pattern was set by the first goal. Vladimir Bryukvin sat out a minor, Mikhail Grigorenko picked out Anton Slepyshev between the hash marks and the CSKA forward saw his shot squirm through Bocharov’s five hole to open the scoring. The rest of the opening session proved fairly even, but after the intermission the visitor was able to take control of the game. With more time in Dynamo’s zone, and far more shots on goal, the stats illustrate CSKA’s dominance. Again, though, it was the Army Men’s power play that made the breakthrough. Mat Robinson, once a Dynamo favorite, unleashed a point shot; Okulov slotted the rebound home from a tight angle. The next goal arrived within five minutes with Okulov again finding the net. This time he was given plenty of space in front of the net to receive Alexander Popov’s pass and lift a wrister into the top corner. From this position, it would take something special for Dynamo to salvage the game and, in truth, the host never looked much like finding it. In the third period the game remained fairly even in terms of possession but CSKA held a clear advantage in shots on goal. And, in the final stages, penalty trouble again undid the host. Michal Cajkovsky and Yegor Zaitsev picked up minors in separate incidents and Dynamo faced a long spell of 3-on-5 play. Cajkovsky’s penalty had just come to an end when Maxim Shalunov fired home a Linden Vey feed to complete the scoring. CSKA regains the lead in the series with a victory that could well reverse any momentum that Dynamo gained from its hard fought success in game two. CSKA, favorite prior to the series, enjoys a 2-1 advantage and is well-placed to win its first cross-town series against Dynamo in the KHL era. The previous two match-ups, in 2009 and 2013, both went the way of the Blue-and-Whites. The guys played well, there was a good attitude among the players. We’ll take that into the next game. What happened with Kirill Kaprizov? About three years ago we were in a situation where one of our guys accidentally hit a member of the national team on the head. He was banned for four or five games and, judging by the reaction, he was lucky not to be castrated. This time the ref said the blow to Kirill’s jaw was not serious enough and nothing further could be done. I’m not a medic, so I didn’t ask Kirill to play in the third period. We couldn’t score a single goal and if you don’t score, you can’t win. Our forwards have managed just one goal in three games, the other came from a defenseman. That’s nowhere near enough against a team as good as CSKA. We need to get to the net more, battle for the puck on the slot. That’s the only way we can have a chance of winning. Both teams played hard, we’ve got our bumps and bruises as well. I didn’t see the Kaprizov incident but there is no excuse for violence. Where you have to fight, fight fairly; hooliganism never brings the right results. Defenseman Maxim Osipov was the Lokomotiv hero after his two goals lifted the Railwaymen to a 3-1 verdict over SKA. 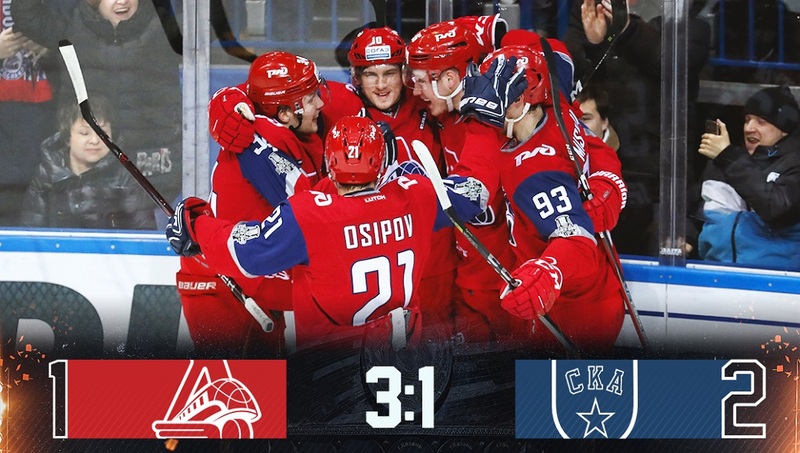 As the action moved to Yaroslavl, the home team finally got off the mark in this series with a vital victory, one that reignites a contest that seemed to be drifting inexorably towards a Petersburg triumph. Osipov, 25, was something of an unlikely goal hero. In the regular season he notched three goals in 54 games, all of them after his move from Salavat Yulaev to Lokomotiv. In playoff hockey he had just one goal from 36 appearances and that came back in 2016 while playing for Torpedo. With Brandon Kozun starting a two-game suspension and Petri Kontiola fighting for fitness, the defenseman picked the perfect time to step up and supplement an offense that was starting to look underpowered. Today’s double strike had no precedent but secured an encouraging victory, backstopped by another assured display from young goalie Ilya Konovalov, who made 30 saves. The youngster was busy from the start, snuffing out a solo from Maxim Karpov as early as the second minute. Konovalov also impressed at the beginning of the second period with a string of good saves that culminated in a block to deny Nikita Gusev’s odd man rush. By that time, Lokomotiv had the lead: Osipov in the eighth minute fired home from the edge of the circle after a marauding run from Nikolai Kovalenko. Late in the middle frame, Georgy Ivanov doubled the lead with an emphatic finish off Yegor Korshkov’s terrific feed from behind the net. SKA sought to raise the tempo in the third period and would go on to spend more than six minutes in possession in the Lokomotiv zone. In the first minute, Nail Yakupov pulled a goal back – Grigory Denisenko was caught with the puck in front of his own net and the SKA forward quickly pounced on the chance – and the visitor had genuine hopes of getting back into the game. However, for all the time spent on the attack, there were relatively few clear chances for Ilya Vorobyov’s team after that. Loko’s defense toughed it out and soaked up the pressure, SKA failed to recreate the scintillating offense that powered Friday’s lopsided 6-1 scoreline. There was one nervous moment for Lokomotiv when Gusev fired against the post on a power play midway through the session but, for the most part, the home team was on top. Victory was effectively confirmed in the 57th minute when Osipov got his second with a wrist shot following a well-executed play after Stepan Sannikov won an attacking face-off. Sunday’s victory gets Lokomotiv off the mark in this series. A repeat outcome in game four on Tuesday, also to be played in Yaroslavl, could transform the contest from a Petersburg procession to a battle to come out on top in every last shift. It was a good, tough game. Maybe there weren’t a huge number of chances, but this was a game where the players needed to battle for everything. Is Maltsev your best player at the moment? We are one team, we don’t pick out individuals. Why didn’t you score more? We need to get more pucks to the net and score more. It was a good, quick, full-blooded game. We scored first and that was important. Is scoring three times a breakthrough for Lokomotiv? It’s a big step forward. The guys are beginning to realize that they can compete with any opponent.